The Rangers open their first-round series against the Capitals tomorrow night, and though the Caps proved last year that entering the postseason as a conference's top team doesn't necessary guarantee a spot in the second round, any No. 8 seed has its work cut out for it. 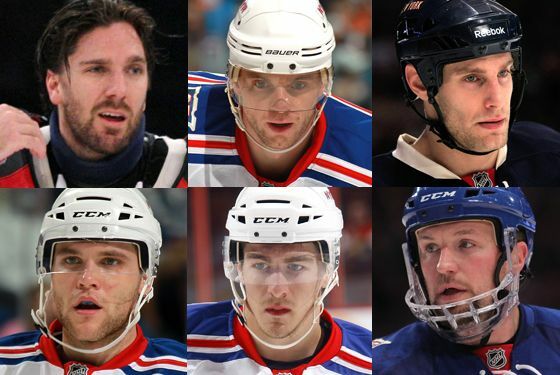 And so if the Rangers are to pull this off, here's who needs to excel in this series. Obviously. Lundqvist is the most important player on the ice for the Rangers at any given time, and for them to advance — especially against a No. 1 seed — they'll need him to be sharp. With Martin Biron out with an injury, John Tortorella's leaned heavily on Lundqvist just to get this far: He's played in 26 consecutive games, and though he's played well as of late, that's a career high. Consider, for a moment, this stretch of the playoff series between these two teams in 2009: Lundqvist recorded a shutout in Game 2, surrendered four goals in Game 3, played one of the best games of his career in a 2-1 Game 4 victory, then had to be pulled in both Game 5 and Game 6. (They'd lose Game 7 on a Sergei Fedorov goal with less than five minutes remaining.) The point: As goes Henrik, so go the Rangers. This was supposed to be the season in which Lundqvist got all the rest he needed, and if Biron hadn't gotten hurt, he would have. (As is, he made fewer starts than any season since his rookie campaign.) The Rangers no doubt know what Jaroslav Halak did to top-seeded Washington in the first round last year. In short: A sharp Lundqvist can make up for issues elsewhere, but a fatigued one probably can't. The good? Gaborik recorded four assists in the Rangers' final five games. The bad? He didn't score a goal himself in his last nine games. The ugly? Tortorella benched him in the third period of last week's 3-0 loss to Atlanta, after a lazy back-check led to the Thrashers' nail-in-the-coffin third goal. Gaborik's scoring totals were down this year, of course — he missed twenty games — but his per-game numbers were down, too: Last year, he averaged .55 goals and .57 assists per game. This year, it's .35 goals and .42 assists per game. The Rangers' offense took a big hit when Ryan Callahan went down, and it's Gaborik, more than any single player, who will need to make up whatever offense has been lost. Gaborik's had his share of chances in the past couple of weeks, but come playoff time, those chances need to turn into actual goals more often than they have been. In four games this year, the Rangers held Alexander Ovechkin to zero goals and two assists in four games, three of which the Rangers won. Expect Tortorella to match up his shutdown defensive pair of Marc Staal and Dan Girardi against Ovechkin's line whenever possible, and its effectiveness might depend on which Girardi shows up. Will it be the one who anchored the top defense pair in Marc Staal's absence during a 6-0 rout of Washington on February 25? Or will it be the one who got beat for one goal and whose turnover almost led to another last week against Atlanta? Obviously, Sauer and McDonagh are not the same person: Yes, they're both standout rookie defensemen on this team's second unit who scored game-winning goals in the season's final week, but they're from entirely different parts of Minnesota, you see. In all seriousness, though, they enter the playoffs in pretty much the same boat: They'll both be asked to log a lot of minutes — surely some in important situations — and they'll do it without any playoff experience. That said, the Capitals have an inexperienced player of their own, and at an even more important position: Rookie goalie Michal Neuvirth will be making his postseason debut — well, NHL postseason debut; he's a two-time Calder Cup winner — tomorrow night, as well. The Rangers' struggles with the man advantage have been well documented — they've scored just once on the power play in the last nine games, and that came on a 5-on-3 — and the Capitals enter the postseason with the second best penalty kill in the league. So really, McCabe represents the power play in general here: Scoring goals with the man advantage won't be easy, but even a mild success rate could be a big boost. McCabe, of course, was brought in to serve as the power-play quarterback this team has lacked for some time, and though he's scored just twice since arriving, his big slap shot remains a major weapon.